No matter the sport, when it comes to the big tournaments, fans want to see the best players taking part and getting involved. This is something that can be said about the World Cup in Brazil at the moment. Many US fans were perturbed at the thought of Landon Donovan not being present at the event but the performance of some other players, including Clint Dempsey has allayed fears about the lack of Landon. Messi has been on brilliant form, dragging Argentina through while Ronaldo couldn’t save Portugal. Seeing the top players in action is important and it is good to see that some of the best NBA players are committing to the FIBA World Cup, taking place in Spain in August. This season, the top team in the NBA was the San Antonio Spurs and this is why it is excellent news that Manu Ginobili has confirmed that he will be attending the tournament representing the colours of his beloved Argentina. Ginobili is not the only Argentinean NBA player heading to the major event, Manu will be joined by Pablo Prigioni and Luis Scola, so there is going to be a lot of NBA fans looking out for this team at the premier basketball event in the summer. It is looking that there may be more than 50 NBA players taking part in the World Cup. It is shaping up that 16 teams will have NBA representation in Spain. As you would expect from a successful team, the Spurs have a strong list of international players at their disposal and the Spurs are strongly represented in Spain. 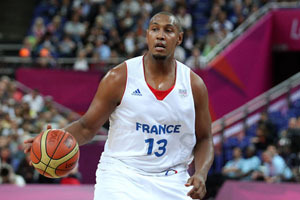 Boris Diaw is likely to appear for France, Tiago Splitter will be in Brazil’s team, Kawhi Leonard is set to star for the United States and in Patty Mills and Aron Baynes, Australia can call on two championship winners at the major event. When club team mates meet at these events, there is usually a level of excitement and this will take place in Group A at the tournament. This is because France, with Diaw and Brazil, with Splitter, will be facing off against each other. As the host nation and the runner up in the last two Olympic Games, Spain will be highly fancied and are the team most expected to compete with USA for the top prize. However, with both teams squaring off against each other in Group C, we get an early chance to see what the two teams are made of. Back in January, the US selected 28 players as part of a preliminary roster for the next three summers with players such as Kevin Love and Kevin Durant committing themselves to the World Cup. The US training camp begins in Las Vegas at the end of July and the team will also be making their way to Chicago and New York before they cross the Atlantic and make their way to Spain, where the tournament will begin at the end of August. This is an ideal time to examine the Futures market for the FIBA World Cup and get your bets on who will win the big tournament.